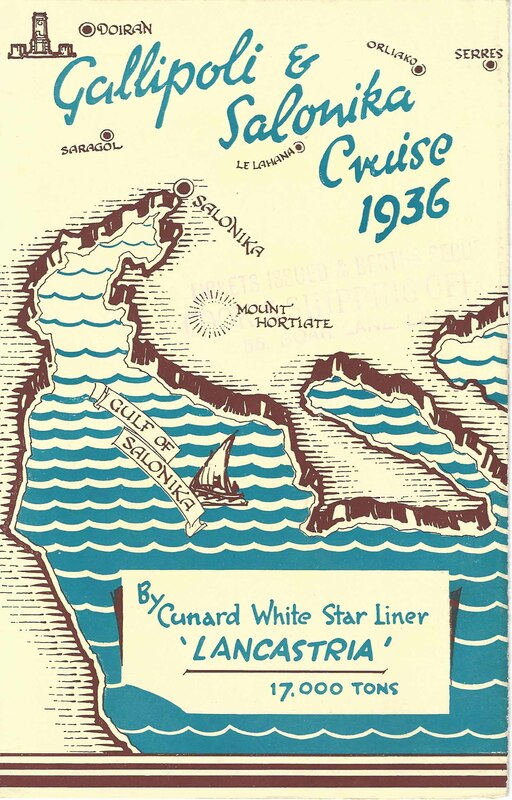 We are delighted to have another post from John relating to his wonderful donation of the Sayers Collection of Ocean Liner Ephemera. This one relates to a fascinating archive within the collection. It’s exciting to find new ephemera for your collection. It’s even more exciting when you find two or more items. It’s most exciting when you find an entire archive that helps to put together all those individual pieces of the puzzle. An archive of material gives you more background to the cards and ephemera, but it can also tell you something about the people who were part of the experience. Let’s be more specific. Suppose that you found a cache of material from a house clearance when you were shopping at the annual Madison-Bouckville Antique Week in New York State in August. 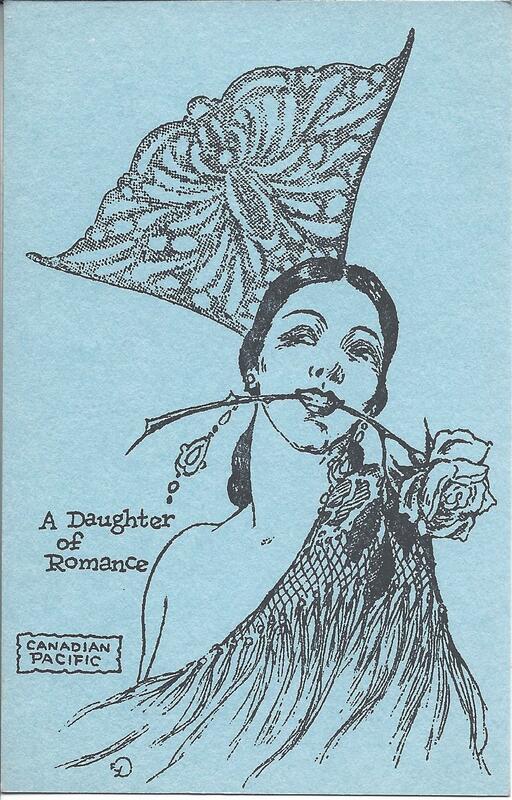 In this case, it was ephemera from a 1930 cruise on the Canadian Pacific liner Duchess of Bedford. The material had come from a house in Rochester, NY, and the vendor was offering the entire pile of ‘stuff ‘ for sale en bloc. If he hadn’t specialized in house clearances, he would probably have broken up the material and packaged and sold the items separately or in small groups. 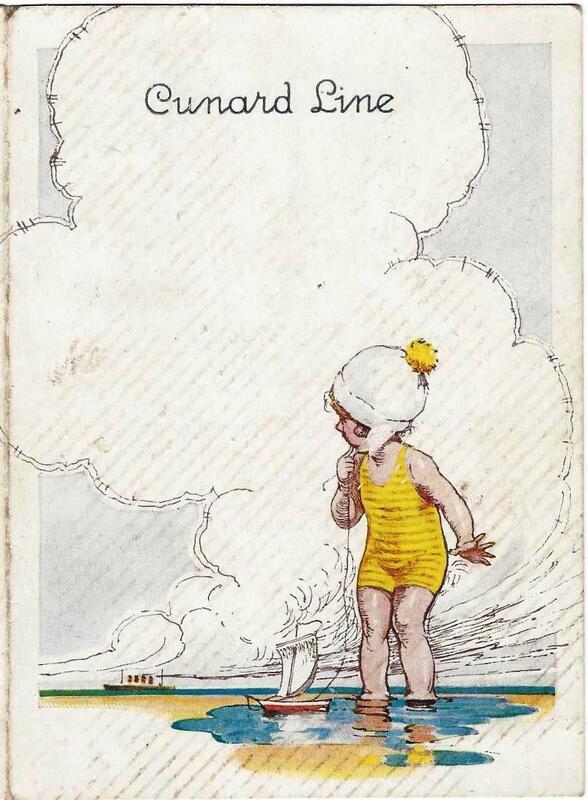 There were De Muth postcards (Figures 1,2), ship’s daily newsletters, menus, farewell greeting cards, letters and envelopes, and a number of other items of ephemera, which all packaged separately would have commanded a total price considerably higher than what I paid for the entire lot. What would have been worse is that dispersing those components to separate buyers would have destroyed many things that this collection tells us about cruising in 1930, and the people who took those cruises. You probably have a number of friends who have taken cruises to exotic destinations. That’s today. In 1930, cruising was not so common, and to take a cruise was to make a statement about your financial health and your sophistication. 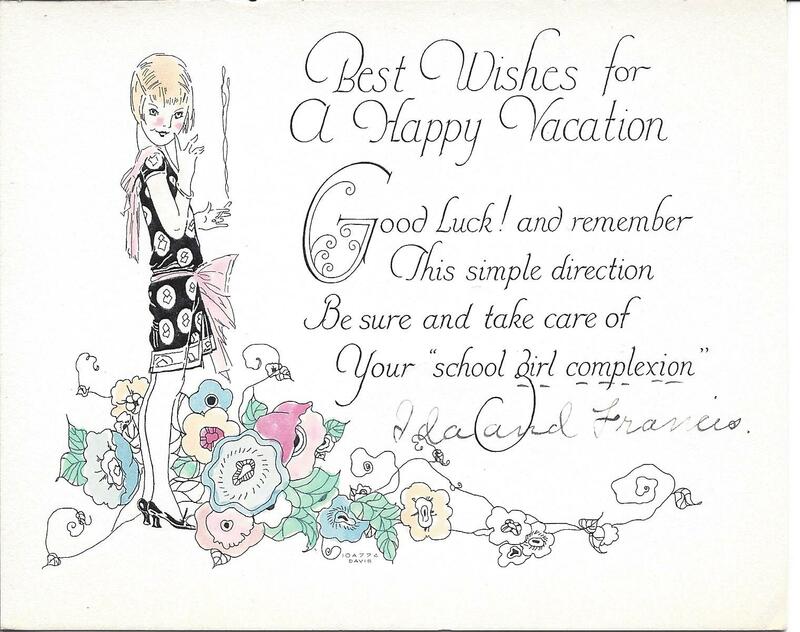 Your friends would have been so impressed that they would have mailed Bon Voyage greetings to you, such as the three examples pictured (Figures 3-5) with distinctly different designs. 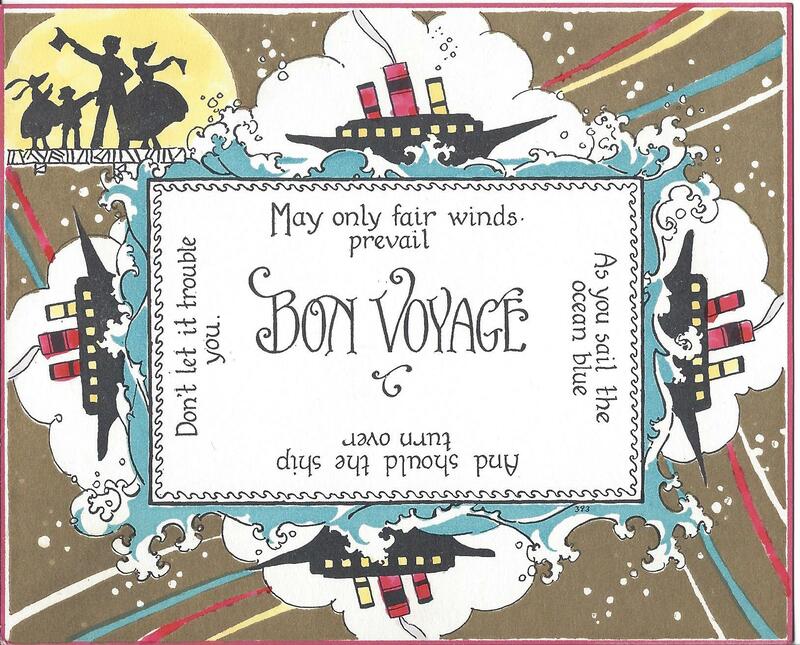 Figure 3: A Bon Voyage card with a caveat – don’t get seasick! Figure 5: “…and should the ship turn over don’t let it trouble you”. Not the most optimistic of messages to send to a person going on a cruise. The cards are delightful and the artwork is sweet. But if the archive had been broken up, you would have been competing with collectors of greeting cards. A particularly scarce trophy is probably the Welcome Home card in Figure 6. Nice artwork – and how many people would send a card to welcome someone home when they could telephone them or maybe even see them on the street in town. It’s not only the greeting cards that would have been a crossover collectible. Some people out there collect telegrams and their attractive artwork. 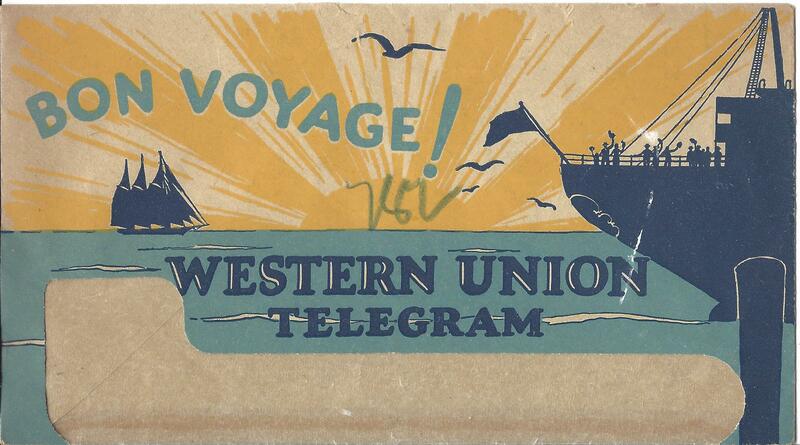 So to buy the envelope in Figure 7, and the message inside, you might have had to compete with a collector of telegrams. All this shows that the couple taking the cruise had a number of sophisticated friends who were impressed enough by the occasion to buy and mail some very nice greeting cards, and even to send a telegram. 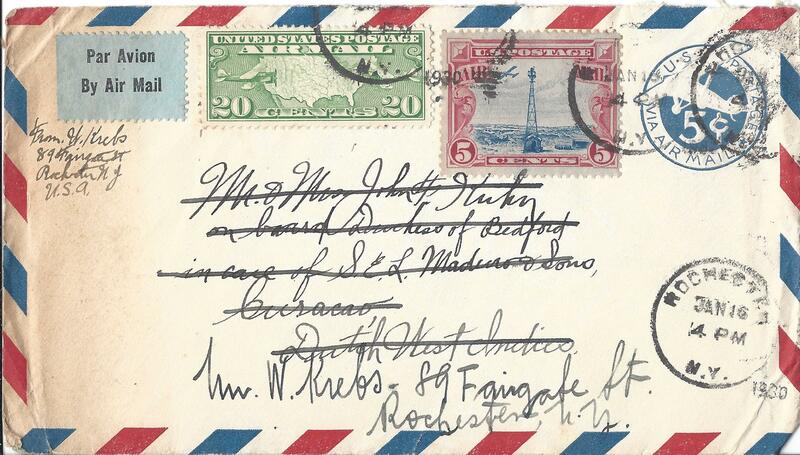 their friends sent the letter and cover in Figure 8 with the comment, “We hope you are enjoying your trip, thought you would like an air mail letter for a remembrance of your trip.” Ironically, it appears that the letter did not get to Curacao in time, and it was returned back to the sender in Rochester! Nice stamps. 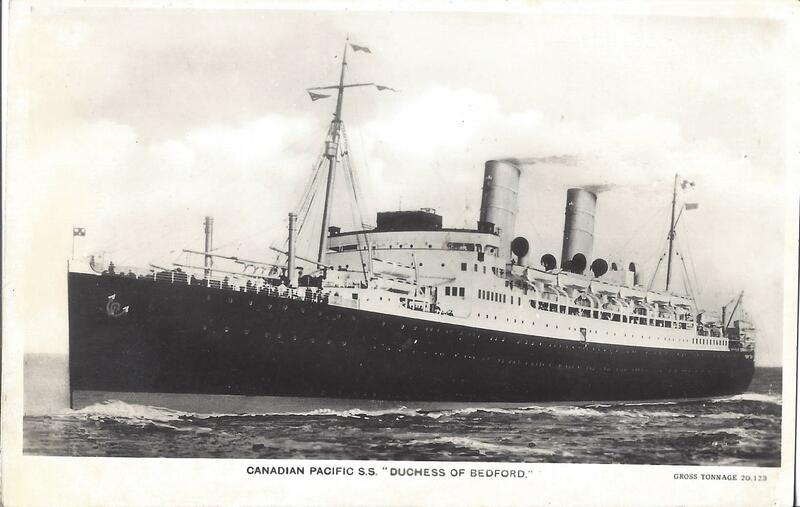 The Duchess of Bedford went into service in 1928, so in 1930 she was a very modern ship by the standards of the day. At some 20,000 tons she was not large, but comparable in size to the Cunard vessels that were her competition. She is pictured on a Real Photo card (Figure 9), printed in England, but with no indication of the publisher. Clearly the travelers sent out some of the De Muth postcards, because one of the letters they received notes, “Received your card from Port de France. Glad to know you are having such a wonderful time.” The De Muth postcards carry strong and unconventional travel images. Many of the comments emphasize the winter. “Emma & Frank, Bill & I were on the toboggan last night, it sure was great. Bill got rammed in the rear end (I mean his car) by a bus.” Sounds like Northern New York State roads were in their usual treacherous winter condition! This trip was played out in the environment which followed Black Monday on Wall Street and the accompanying stock market crash and financial meltdown. Had our travellers prepaid their trip before the meltdown took place? Would they be coming back to a personal financial disaster? We can’t tell from this material, but we can get a feel for the world financial crisis which must have cast a cloud over their vacation. One issue of the ship’s daily newspaper carries the story that “Several hours before he was to set sail for Europe, Herbert Martin, wealthy business man, fell or jumped to his death from his apartment window to Park Avenue, nine floors below.” Maybe from a bad day on the stock market? Yet another issue of the daily Canadian Pacific Wireless News includes the report that “The Local Government of Chicago is in financial distress and has failed in an attempt to float bond issues. It is feared the schools will have to close.” Imagine being on a month-long cruise with this – and other financial distress stories – being part of every day’s news. 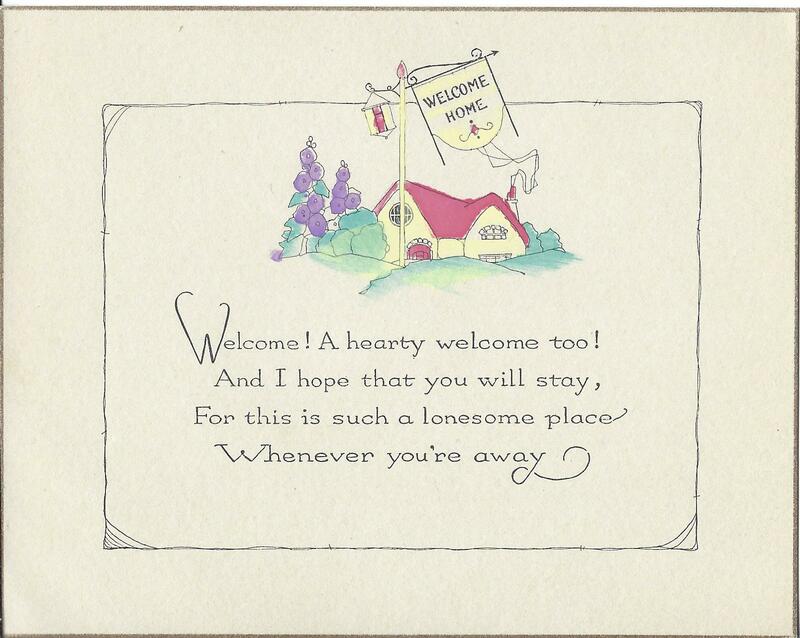 We have seen the Welcome Home card. Other letters offer to pick the couple up at the train station if they can advise of their timing. Clearly they had a strong support group of friends. One final thrill from an archive such as this is that it is a potential genealogical gold mine. There are names – lots of names – and communications from all these people in Rochester, New York. If I had only the De Muth postcards, or just a batch of daily ship’s newspapers, or merely a collection of menus, there would be only one window on this trip. This group has more historical color than a stained glass window. So even if you collect only one type of ephemera, when you can find a comprehensive archive like this – go for it! John G. Sayers has completed 9 years on the Board of The Ephemera Society of America, and 7 years on the Council of the British Ephemera Society. He has been a keen collector for many years, and can be reached at jasayers@saybuck.com. All images are from the Sayers Collection at the Johnson Collection. Not only is John Sayers giving his collection to the Bodleian Library, but each tranche of his donation is accompanied by articles on specific types of ephemera or individual items. His notes on menus attached to postcards provide fascinating insights into a little-known genre of ephemera. It is relatively easy to find menu postcards from shipping lines – a brilliant marketing concept in which the traveler is given a menu and on the back is the address side of a postcard. On ships, these were generally for the lower classes of passengers. 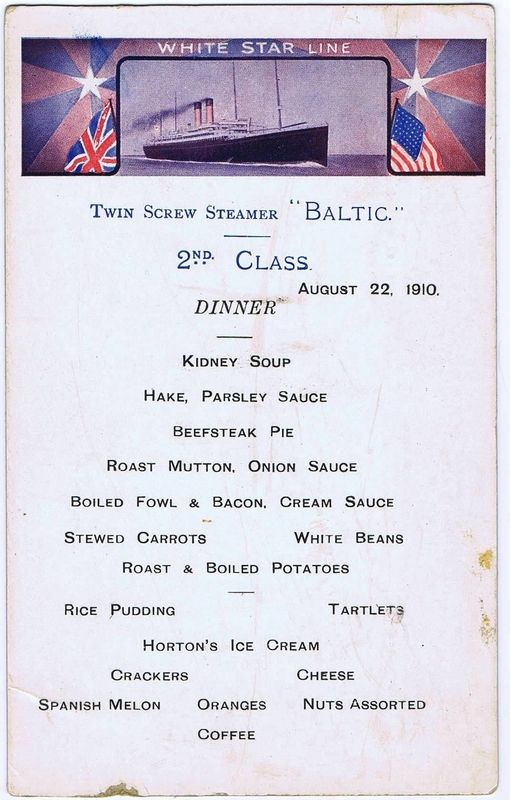 If you travelled on the Baltic of the White Star Line on August 22, 1910 (PM80A) your Second Class Dinner Menu would offer you the challenge of making decisions regarding Kidney Soup; Hake with Parsley Sauce; Beefsteak Pie; or Roast Mutton. To the collector with a developed sense of culinary delights, the offerings in this menu may not be very impressive. No caviar. No smoked salmon. No lobster. No elegant pâté. And no hint of foie gras. Those highlights certainly appeared on menus of those travelling in First (a.k.a. Saloon or Cabin) Class. However, to put the situation into context, if you were migrating to North America from crop failures in Europe, potato famine in Ireland, or subsistence living in a large British city, these menus would seem like a king’s feast. The back of this card carries the announcement that “The Largest Steamers in the World” are being built, and refers specifically to Olympic and Titanic “Each 45,000 tons”. Yes there was room for a brief message, but the primary objective was to promote the line and its services, while presenting the menu for the meal. 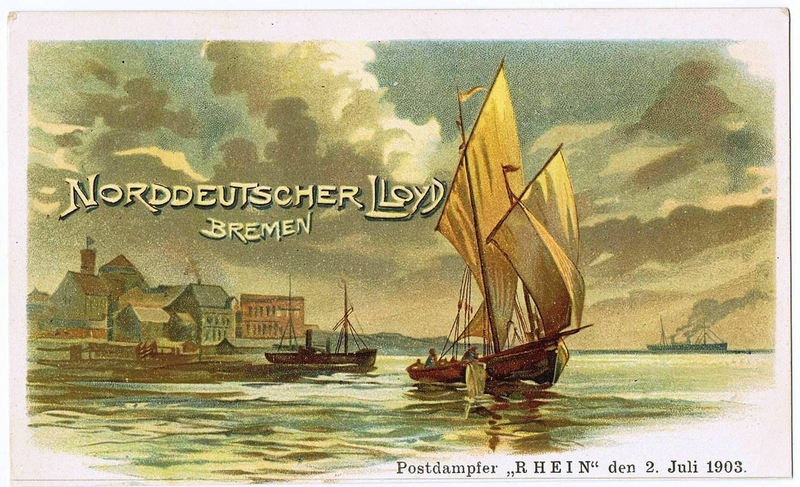 For several years I was attracted at postcard shows by beautiful artist-drawn cards of the North German Lloyd shipping line (PM80B) and the Red Star Line, with the name of a ship and a date in the early 1900s. Being an ocean liner collector I bought them, but couldn’t solve the puzzle of why the shipping line would have put a date on them. The name of the ship – yes. The date that the card was obtained – no, why would they do that? The problem was solved after many years when my wife, Judith, and I found three postcards with menus attached below them at a vintage paper display at the vast antiques fair in Brimfield, Massachusetts. 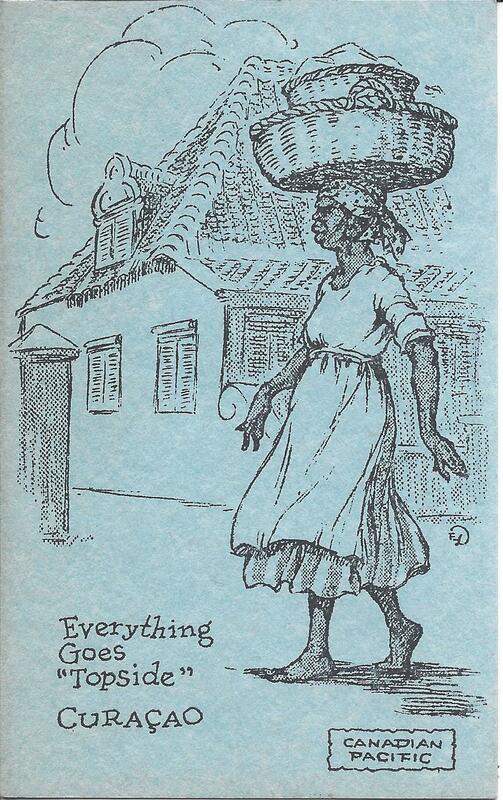 These were from the Red Star Line, a creator of some beautiful cards a century ago. At the top – a detachable postcard. Below – the menu for a meal on a particular date on board the ship. For the shipping collector, the synergies are blatantly obvious. But why collect these as a postcard collector? First, they represent the way that the postcards first appeared – attached to a menu. 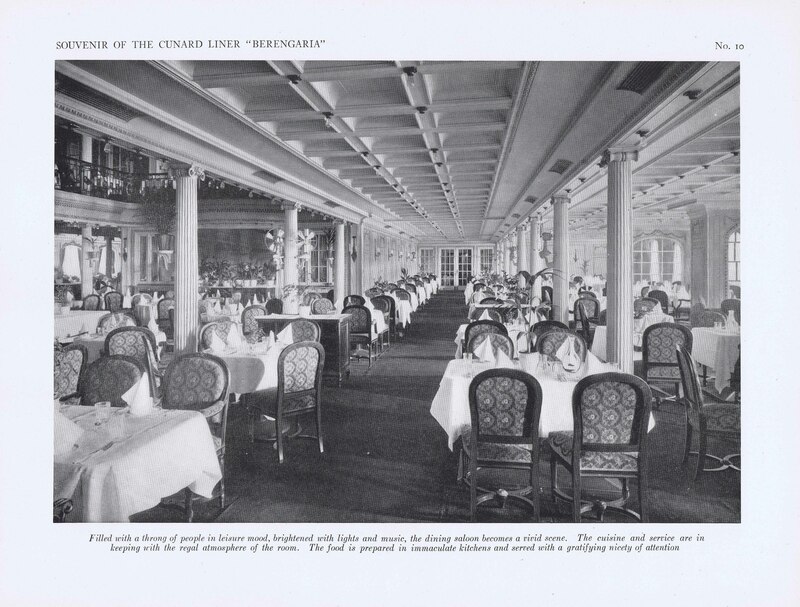 Second, they establish the place where the postcards were acquired – a dining room on a particular date on a specific ship. How many postcards (artist-drawn, shipping, or otherwise) provide this type of provenance unless they have been posted and have a clear cancellation? Finally, and in many ways the most important feature, the combination shows that the postcard alone is in some cases missing a significant part of the artwork’s image. 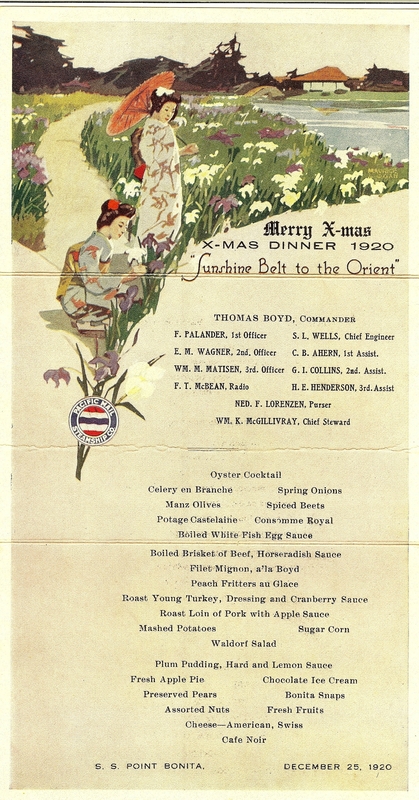 The most extreme example is a 1920 Xmas Dinner card and menu of the Pacific Mail Steamship Company (PM80C). When you look at the illustration, you can see that having the postcard alone would tell only part of the artist’s story. The beautiful garden would be cut off, the lower Geisha girl would be chopped in half, and the balance of the picture – the entire effect of the garden trailing into the shipping line logo – would be missing. Who would want an artist-drawn card with a piece of the artwork missing? For the ephemera enthusiast, these have the delight of carrying the menu for a meal on board ship, with the specificity of the date and the name of the ship, and in many instances excellent artwork, signed in many cases by the artist such as Cassiers working for the Red Star Line and Tivo for the North German Lloyd. Of course, you wouldn’t know that you were missing part of the image. If you weren’t alerted before you read this report, you now know to scrutinize postcards for: (i) the name of the ship and a date printed in black; (ii) an image that seems to have been cut off (i.e. it looks like it might bleed beyond the lower edge of the card); and (iii) the lower edge of the card is not clean-cut (these cards were generally perforated or otherwise scored, and detaching them would not have left a clean edge). You may also find that the card is smaller than the normal card size, where the perforations did not hit the right place on the initial sheet. We haven’t found many of these at postcard shows. Our experience shows that you are much more likely to find them at an ephemera fair, categorized under ‘Menus’. It makes some sense, because a postcard dealer offers postcard collections, generally coming from an estate. His or her protective sleeves and display boxes are designed for the dimensions of postcards, and these postcard/menu combinations do not fit into a conventional postcard display. A first-cousin, as it were, to these postcard/menu combinations is a full-page menu designed so that it can be folded in three panels with space on the back for an addressee on one panel, and room for a brief letter on the other panels. This format is represented in the President Jackson and President Wilson examples in PM 78 and PM79. There are other examples elsewhere in the Collection, notably in the menus of the NYK Line of Japan, contained in that section. This style of menu and message combination appears to be confined to the Pacific Ocean passenger liner fleets of both Japan and the United States. 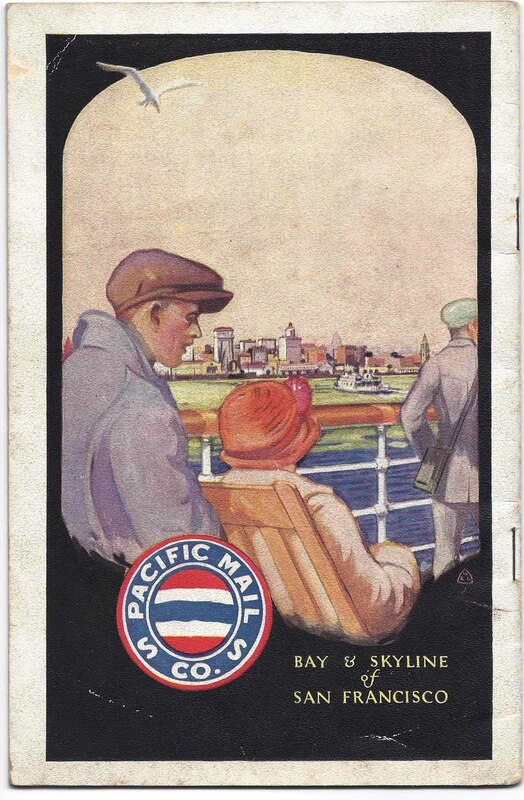 As with the postcard variety, the objectives of the shipping line were to facilitate the passenger sending messages about his or her trip, to give those passengers an activity for their spare time during the long voyage, and most importantly to promote the shipping line and whet the recipients’ appetites for ocean travel. These postcard and letter card variants might not appeal to a narrowly-focused postcard collector. That postcard collector would face the prospect of having to acquire A4 or 8 ½ x 11-inch acid-free sleeves and put these trophies in a separate 3-ring binder as Menu Cards, or merge them in the same type of sleeve in the body of a Menu collection. From personal experience, postcard/menu combinations in a dedicated binder could be fairly sparse for the first 20 or so years! 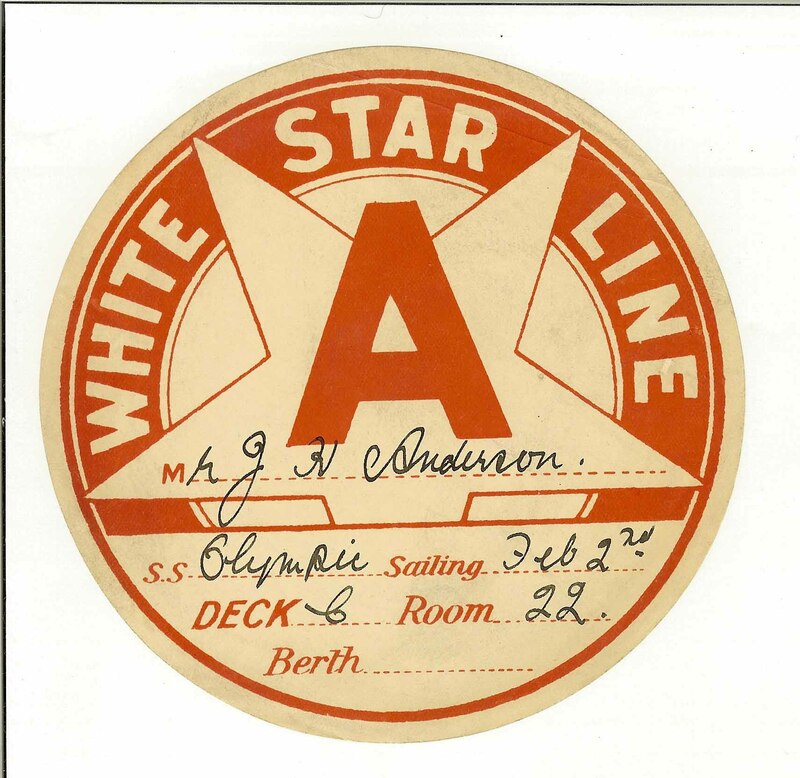 We are delighted to announce a major donation of Ocean Liner ephemera: the Sayers Collection. 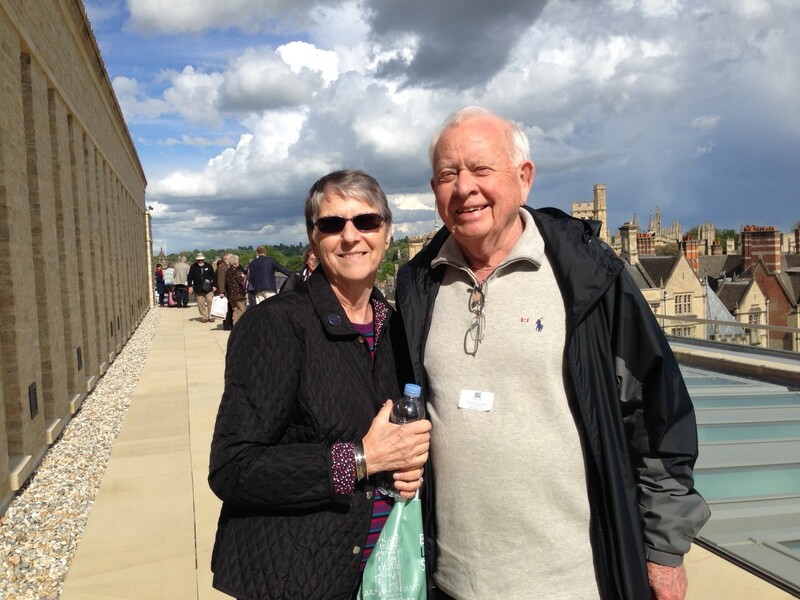 To launch it, we interviewed the collector & donor: John Sayers, seen here with his very supportive wife, Judith, on the roof terrace of the Weston Library. 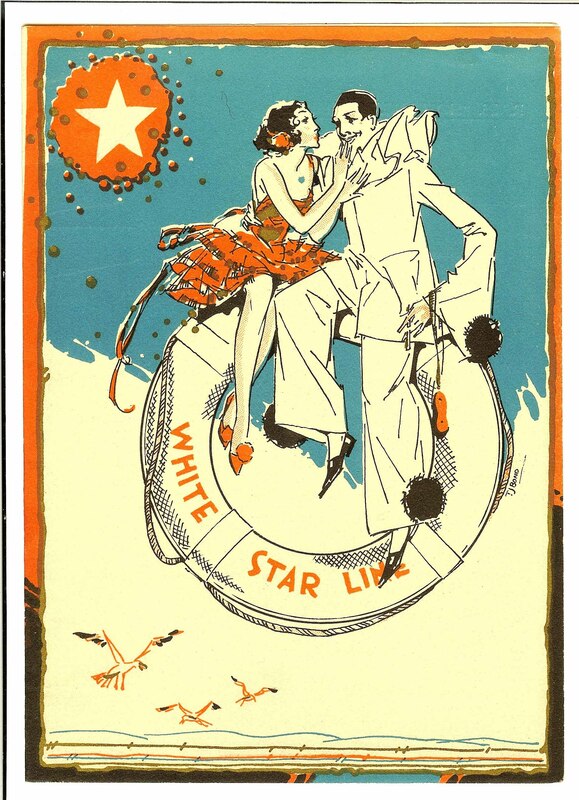 What sparked your interest in ocean liners and, in particular, the ephemera relating to them? A combination of personal recollection and a lifelong interest in history. 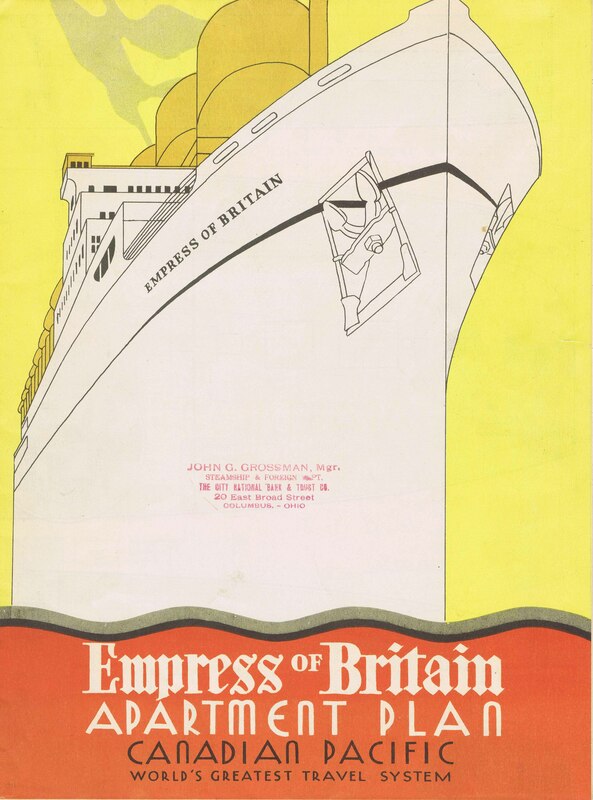 The personal recollection dates back to travelling with my parents on the RMS Queen Elizabeth; the interest was sharpened by my history major in university and in particular a fascination with both design and social history. How (and with what items) did your collection begin? I began with enamel souvenir lapel pins, like the one that I brought back to Canada in 1954 as an RMS Queen Elizabeth souvenir gift for my late aunt Beth (you know, the maiden aunt who has everything!). That interest expanded to other three-dimensional objects with enamelling. 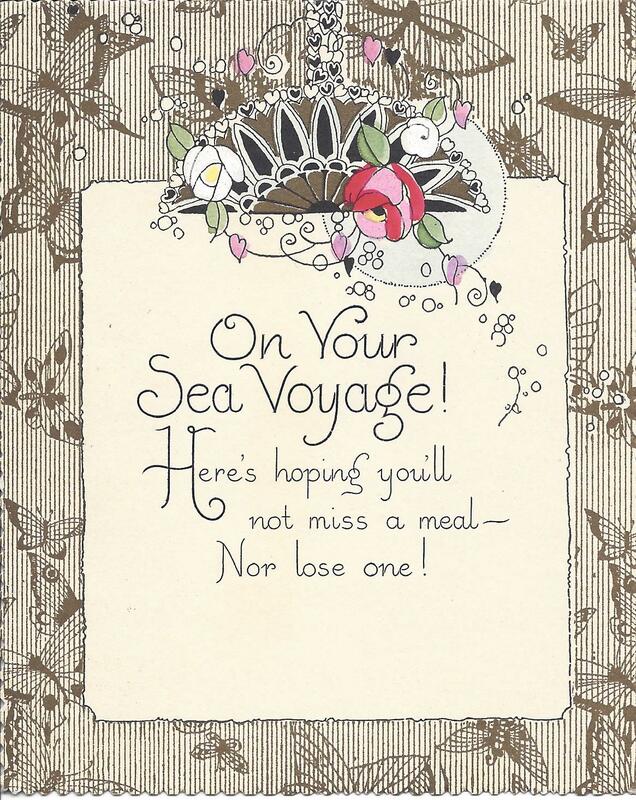 That focus was then enlarged by the first foray into ephemera, to reminisce about meals on board [Figure #1], baggage labels [Figure #2], and all the other printed reminders of life on a great ship. However, I discovered such a broad information landscape in ephemera that I eventually divested my three-dimensional objects to become completely immersed in ephemera. What did you aim to achieve through the collection? Has that aim changed? In terms of ephemera, the objective was to provide a record of what took place on board a ship; what happened beforehand to plan the trip; and any effects afterward where there is a relevant follow-up experience. The change of the aim occurred when I discovered that there was a further enlargement to my scope. The scope had originally been established as North Atlantic steamships. However, I came to realize that those that plied the South Atlantic were also interesting and relevant. Then I discovered Pacific Ocean shipping. 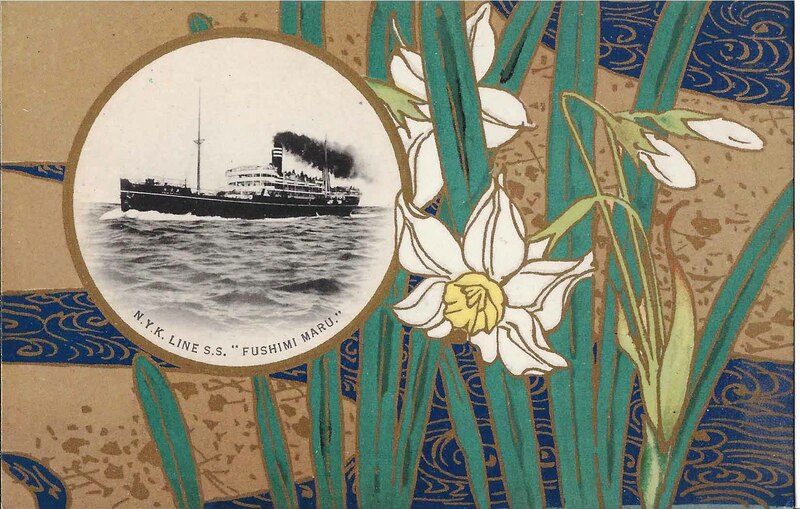 Part of the attraction was the beautiful artwork on the Japanese NYK Line ephemera [Figure #3], and the equally attractive designs produced by the Pacific Mail Steamship Company [Figure #4] and the Dollar Line. I believe that the way to describe this phenomenon is ‘topic creep’. How has the collection evolved? As well as the directions I have already mentioned, the collection has gained a greater reflection of social history and business elements. As with most collections that have evolved over 40+ years, there has been an increasing appreciation of the nuances. For example, as well as First War Hospital Ships that served during the campaign in the Eastern Mediterranean, there was a Cunard tour in 1935 to Gallipoli, advertised in a Cunard promotional booklet, to revisit the terrain and the landmarks of the First War [Figure #5]. I would guess that the primary participants in the tour would have been the next of kin of those that did not come back alive, but one speculates on the motivations of those who sailed in 1936 on that Cunarder. A similar event occurred in 1936 with the pilgrimage of over 5,000 people from Canada to attend the unveiling of the Vimy Memorial. Yes. Passionately. I have described my collection as a pointillist painting, that continues to need more ‘dots’ to add to the clarity of the image. Shipping ephemera with a tinge of social or design elements. 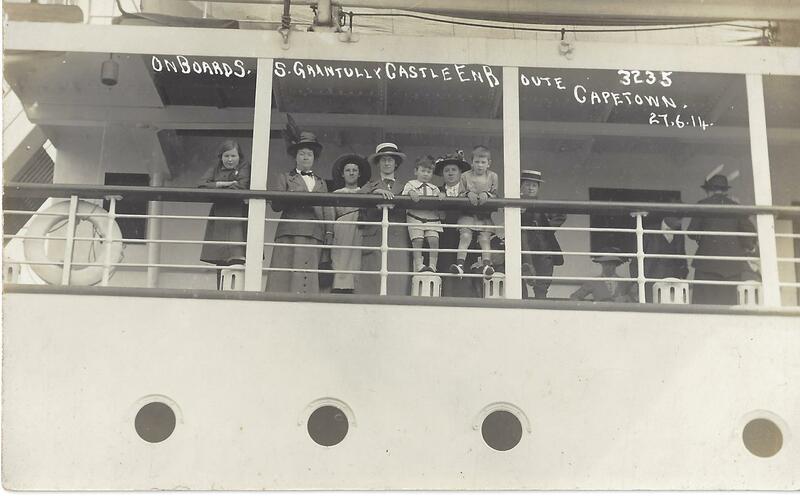 For example, I recently acquired a Real Photo postcard captioned “On Board SS Grantully Castle en route to Capetown, 27.6.14” [Fig #6]. The beginning of the First War was only two months away. The young children pictured in the deck scene would not have been directly affected, but their fathers, if not already in the military, would certainly soon have been. What insights into social history does this material offer? The material in the Sayers Collection touches upon issues such as; class differences; matters relating to the status of women; the struggles of immigrants; the habit of smoking; the treatment of children; racial stereotypes; and troopship life in both World Wars. Specifically, the frustrations of women and the tinder for the sparks for the women’s rights movement are quite evident in some material. For example, a 1930s postcard image of a Smoking Room among the 100 or so of them in my collection was later displaced by an identical image on a card written by a woman bemoaning the fact that she is not allowed into this men’s domain. What inspired you to donate your collection to the John Johnson Collection in the Bodleian Library? We have been supporters of the John Johnson Collection for over a decade and during that time we have come to appreciate the professionalism applied to the Collection and their broad appreciation of ephemera. An emotional reason is my British parentage and the massive role that Britain has played in global shipbuilding and shipping operations over the years. The Sayers Collection reflects the role of Britain as a major influence in global shipping operations, whether it be as the builder of Canadian Pacific’s 1930s premier liner, the RMS Empress of Britain [Figure #7]; as the operator of ships such as Cunard’s RMS Berengaria, originally the German liner Imperator, seized as war reparations after the First War [Figure #8]; or as a major global competitor to shipping companies of several other nations (whose ephemera is also well represented in the Collection for purposes of comparison). This collection will add extensively to the ocean liner material collected by John Johnson, to provide many more opportunities for study and research. How do you hope that future users/scholars will explore your collection? For the design, business, history, or social history scholar, whatever their thesis, there is a good possibility that material in the collection will provide a valuable resource. Alternatively, the material may trigger a line of study for those seeking a fresh avenue to pursue. There are opportunities for study and research on many planes. As a Chartered Accountant, I can appreciate the opportunities to study the various business aspects of the industry, ranging from advertising and promotion (an elaborate 1876 Cunard commemorative book appears to represent one of the earliest examples of modern-day ‘co-operative advertising’) [Figure #9], to the costs of menu offerings over many decades. In regard to the latter, did costs increase using constant dollars, and did they reflect the same percentage of passage charges? What culinary offerings have been added and deleted over the years? Why? It would be useful if at some stage all the Passenger Lists could be digitized and made searchable. 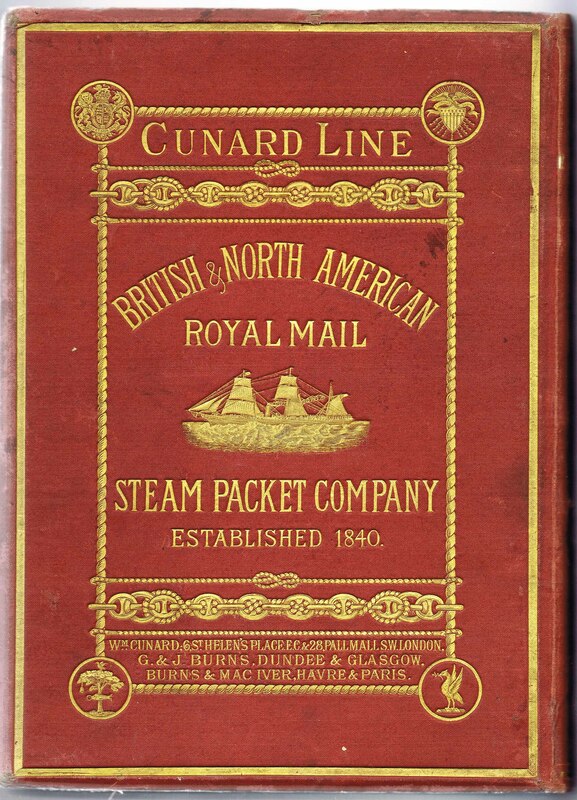 As well as the Cunard ones already delivered to Oxford, there are more to follow from other lines. The end result would be a useful database for genealogists, students of patterns of military deployment, celebrity hunters (at one time they all had to travel by sea! ), industrialists, and the frequency of the use of servants, to name a few topics. What advice would you give people starting a collection today? Collect something that has meaning for you. And make sure that you collect ephemera! The great delight of ephemera is that the universe is not defined, so (unlike postage stamps or cigarette cards, for example) you never know what you are going to find that illuminates your knowledge or memories of a particular topic. When a collector describes an acquisition as something that ‘speaks to me’ he or she is describing the impact that the piece has upon their memories or their knowledge. I never purchase anything on line. I have to see it. That means going to postcard and ephemera fairs, which my wife, Judith, and I enjoy immensely. Don’t feel that every specimen has to be many years old. All ephemera was new once! I like the 1920s and 1930s, and objects of that period such as menus [Figure #10] do not have to cost a fortune, while often providing fascinating cover artwork and food choices inside. Whether your interest is fashion, food, design, autos, ships, planes, social history – or even your local city or town – there is material out there to stimulate your interest.